Take it up with the former president of the homosexual Log Cabin Republicans, Gregory T. Angelo, as he has said and posted evidence that says differently. Don't cha just love how the mainstream media reports things? "the Republican iconoclast accused of sexual misconduct"....you forgot to mention that the unfounded accusations were from 40+ years ago. In any event, if Moore appears to be a the front runner as election time nears, Donald Trump and his rainbow flag waving Republicrat Party will undoubtedly join in the smear on Moore like they did before, as the last thing that they want in the US Senate is a God-fearing man who knows the Constitution of the United States and will defend it. yes, it say he does not hate homosexuals, but does not claim he advocates for them. First let me thank you from the bottom of my heart for sharing your opinion on these matters that I'm posting. "Rather, Angelo says, Pence argued that the law wasn’t intended to discriminate against LGBTQ people, and eventually signed a bill clarifying that the law should not be interpreted as permitting anti-LGBTQ discrimination." It kinda sorta seems to me that when a politician signs legislation that prohibits discrimination against those that engage in homosexuality, (desires and behaviors that people are not born with and that are changeable through spiritual and often times psychological therapy) that they are "advocating" for the homosexual movement. I had heard about this a while back. It makes total sense to me. A pastor friend of Judge Roy Moore has made some .... comments about the Senate hopeful with regards to the accusations of sexual advance and assault that have been levelled against him. “Judge Roy Moore graduated from West Point and then went on into the service, served in Vietnam and then came back and was in law school. All of the ladies, or many of the ladies that he possibly could have married were not available then, they were already married, maybe, somewhere," Pastor Flip Benham said, according to Right Wing Watch. Can you believe it? After serving his country Roy Moore came back home and didn't want to hook up with a woman that had abortion after abortion and venereal diseases. What's wrong with that guy? That's un-American! If he is seriously running and, or elected to a government office, then it would be folly to openly discriminate against anyone in today political landscape. Show me where Mike Pence openly advocates to support homosexuals? You dislike Trump because, accordingly to you, he supports homosexuals when he is one of the most open bigots in Washington, yet he is too tolerant for you? My question to you is why is not Trump bigoted enough for you? There are good reasons to dislike Donald Trump, but not being bigoted enough is not usually one. You are soft-soaping it. He got busted and most thinking persons do not buy the baloney. The only people who still support his are those who are dyed in the wool racists and in Alabama, unfortunately, they are quite a few. Rather, Angelo says, Pence argued that the law wasn’t intended to discriminate against LGBTQ people, and eventually signed a bill clarifying that the law should not be interpreted as permitting anti-LGBTQ discrimination." If he [Mike Pence] is seriously running and, or elected to a government office, then it would be folly to openly discriminate against anyone in today political landscape. Show me where Mike Pence openly advocates to support homosexuals? "After much reflection and in consultation with leadership of the General Assembly I've come to the conclusion that it would be helpful to move legislation this week that makes it clear that this law does not give businesses to deny services to anyone," Pence said at a press conference on Tuesday. "Let me say that again. I think it would be helpful and I'd like to see on my desk before the end of this week legislation that is added to the Religious Freedom Restoration Act that makes it clear that this law does not deny services against anyone." Those are excellent questions that will cause me to do some serious self reflection on this topic. How about I get back to you with an answer, let's say 3 weeks from next Tuesday? Excellent points. Perhaps using the following person as a role model will help people believe that Judge Roy Moore has cleaned up his act. Hoekstra’s complaint about Vice-President Pence appears centered upon the fact Hoekstra is a homosexual, and evidently believes the Trump administration in general, and Pence in particular, somehow are targeting men and women in homosexual community. “As an alumni [sic] of Taylor and as a gay man I’m pretty personally injured by the policies of the Trump/Pence administration and I know that a lot of alumni who identify as other minority groups are personally affected by the Trump/Pence administration,” Hoekstra told Newsweek magazine on Thursday of last week." Mike Pence should travel with Republicrat rainbow flag waver and open homosexual Milo Yiannopoulos, as he was quite sought after during primaries as a speaker by Donnie and his faux conservative lemmings. Oh wait, his video embracing 'man-boy love' made the Republicrats ditch him as the PR was very very bad. The world needs to be set...ahem...straight that Mike Pence and his orange haired boss are NOT anti rainbow flag waving bigots! I can think of no better roadshow than the "Mike and Greg Show", coming to a town near you soon! Get your tickets now, as rainbow flag waving Trump lemmings are buying them out fast! Don't cha just hate typographical errors? 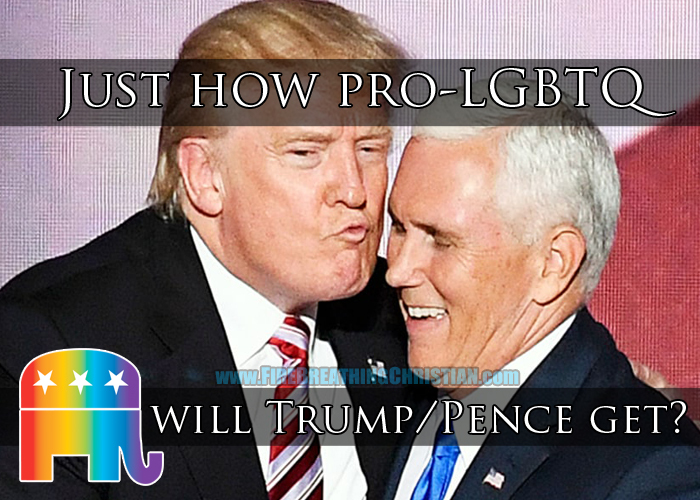 The above should say "Just how much more pro LGBTQ will Trump and Pence get?